For the first time in 5 years, B’z is going to perform on a Music Station SUPER LIVE. The Music Station SUPER LIVE is set to be broadcasted on December 21st, 2012 from 7PM to 11:10PM. It is still unclear which song(s) the band is going to perform on television, but one might think that this is a perfect occasion for a rendition of “Itsuka no Merry Christmas”?! Or perhaps B’z is going to perform an entirely new song? What do you think? The last time B’z has appeared on a broadcast of a SUPER LIVE was in 2007, when they performed their then latest single SUPER LOVE SONG. 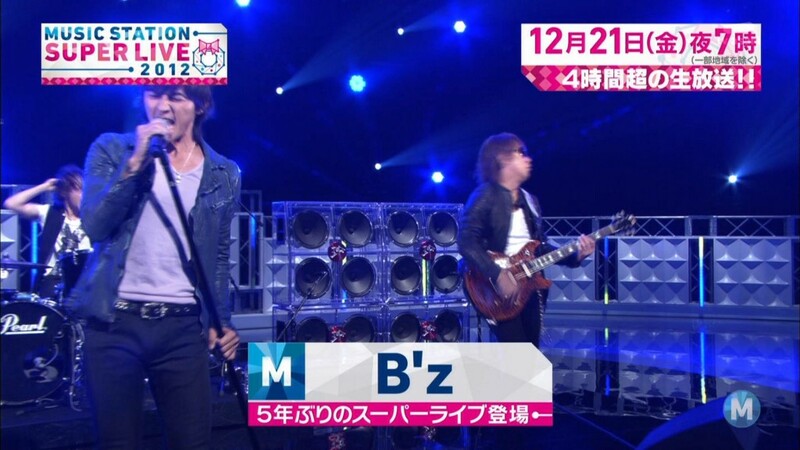 But this isn’t exactly the last time B’z has appeared on television. The band was performing on a Music Station special last year on April 1 to show their support for the earthquake victims. They performed Brotherhood and Sayonara Kizu Darake no Hibi yo. Now I just need to get a ticket to there. Unluckily it’s allmost impossible to get one… I’m missing maybe my only chance to see B’z live in my life. Sad. I bet that is the only time they are performing before february 4th. Why do you think that? B’z might also perform again in the US(but not next year) or maybe even in Europe. Itsuka is probably an obvious choice but at the same time, they might just play songs from their mini-album (I still think that 5 tracks is NOT an album unless each songs are ridiculously long) they released this summer. Maybe Love Bomb and Into Free. Or a new song. Who knows? I’d love it if it was also the new song, it’s long time left so who knows ^^ I liked it that last time in April they had much longer performance than other artists, I hope for more than 1 song this time too. Hey, what’s wiith you?? I am kicked out of this panel?? I don’t know what I have or had do wrong. Maybe my insecure english?? Or was it about my wrong email adress?? First of all, no need to get angry. I haven’t done anything. Second of all, every unknown person to comment on this blog is subject to approval. Yes, you were apparently mistyping your E-Mail address which is why the comment was left for approval. I appologize,really. It was my fault,sorry. Hope anyone could enjoy the super life show:). It wasn’t avialable in Germany , anywhere ,I think. I don’t want bother anyone, so I beg your pardon. Hey , want to receive the *Super Live * from TV Asahi, but I don’t know how. Please, please can anybody help? Very nice performance. イチブトゼンブ and 愛のバクダン were performed. Very classic performance of 愛のバクダン. I was surprised by the songs, I didn’t expect those ones. But very good. I didn’t get tickets so I had to watch it from TV. I have a question: was the seconed one Ai no Bakudan?, because ,I can’t read the Kanji( I only can read the Kana). It amazes me how youthful and joyful they can be on stage! Definitely the best performance from them all for me! I understand why they’ve chosen these too songs for the setlist (although I was expecting Itsuka no Merry Chistmas).